Over the past decade, municipal 4-Pillars drug strategies have been expanding across Ontario to respond to alcohol and other drug use issues, which are felt most acutely at the local level. These integrated, locally-based approaches are gaining increased credibility as successful, cross-sectoral responses that aim to improve the quality of life for individuals, families and communities across the province. WGDS projects are typically cross-sector and multi-service in scope. The WGDS initiates discussion and relationships amongst all community stakeholders which respond to, or are impacted by, substance use challenges. By bringing diverse perspectives to the table, the WGDS, like other Four Pillar Drug Strategies in Ontario, works to bring about positive change that is effective and sustainable. 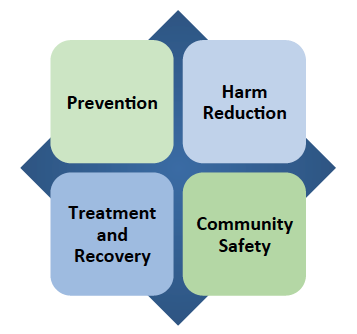 The Four Pillars of the WGDS are: Prevention, Harm Reduction, Treatment/Recovery, and Community Safety.